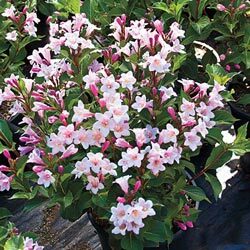 Draw hummingbirds and other beneficial pollinators to your garden with the reblooming Polka Weigela. 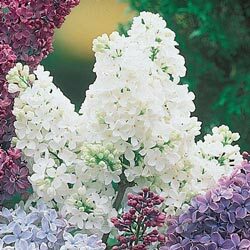 This variety grabs attention very easily with its intricate color display and sophisticated plant form. That makes it very handy in landscaping-it is impressive as a hedge, a great mixed border addition and a bold accent planting. 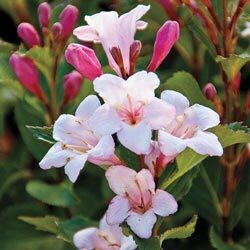 Weigela are generally known for their ornamental foliage, and Polka is an excellent example of that! Unique, rounded leaves are colorfast; keeping their handsome, dark green hue throughout the whole growing season. Such lush, dense foliage creates a lovely backdrop to its bright bicolor blooms. 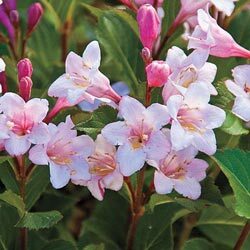 It pairs nicely with other perennials, which also benefit from its foliage and flair. These are more colorful than regular lilacs, and all but the deep purple boast exceptional double flowers. Germination Cut branches back 1/3 - 1/2 at planting time to encourage branching. Planting Instructions: Dig a hole at least twice the size of the weigela's root system. Place plant in ground and use enough water so that soil is moist throughout. Soil Requirements: Grown best in average moisture soil that is well-drained. Pruning: Prune to desired shape if needed immediately after blooming finishes.